LED may be a green, energy saving technology but the initial investment in LED fixtures will be more expensive than purchasing traditional fluorescent fittings. In our example we show you the calculations so that you can see how quickly it takes to get a return on the additional investment that you have made in LED technology. You can also do the same calculations to work out the return for any retrofit LED bulb. Around this time last year I wrote an article reviewing whether or not it was cost effective to upgrade your fluorescent ceiling lights to LED panels. 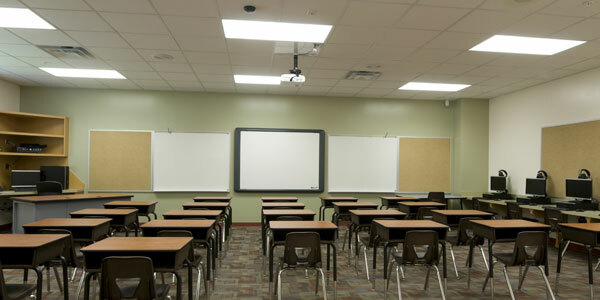 The article was specifically talking about the 600x600mm recessed lights you usually find in schools and offices. Assuming the room was already using fluorescent lights, I compared the cost of replacing all of the tubes with the cost of fitting new LED panels. In last year’s article I estimated that the payback of switching to LED against the cost of running fluorescent tubes was between 8-9 years for an average sized office or classroom. I think for many this meant switching to LED was too big a commitment to be worthwhile. For anyone who is keeping an eye on LED lighting you’ll already know that advances in the technology are coming thick and fast, production techniques have improved and the market is more competitive. This is great for us as the LED panels we originally costed at £59 each are now available for £20 each. This means it’s time to get our calculators out and see if changing to LED panels is more worthwhile. In year 1 we can see that the cost of switching to LED is £165.60 more than refreshing and running the fluorescent fittings. However we can also see that LEDs are £166.40 a year cheaper to run. This means that by the end of the second year you would have recovered the initial investment of purchasing the panels and all subsequent years would provide you with a cost saving. For me, this now makes switching to LED panels a worthwhile investment. Especially if your fluorescent tubes are nearing the end of their working life and would need replacing anyway.